Our Boykin Spaniel, Cocoa, has never met a human she doesn’t love. Big, little, bold or timid. If someone is offering ear scratches or belly rubs, Cocoa is their friend. She was in doggie heaven the day we took her to our church’s Fall Festival. Little kids in costumes accompanied by parents and grandparents filled the church parking lot. Teenagers and college students were helping with games and activities. They all seemed to want to love on Cocoa and she ate it up—along with every dropped popcorn kernel she could get her tongue on. A commotion across the parking lot heralded the arrival of one of the church’s senior deacons. Dr. Kent had been gravely ill for quite some time and it was surprising to see him out and about. I knew Dr. Kent and his wife well enough to speak in passing but not well enough to make a beeline across the parking lot to speak to them. Cocoa, however, was mysteriously drawn to this man and no discipline techniques I’d learned in doggie obedience classes prevented her from dragging me over to Dr. Kent. It was a little bit embarrassing. She clambered over kids and nearly knocked over two older ladies to get to the front of the line of people gathered to speak to Dr. Kent. When Cocoa got to Dr. Kent, his face lit up and I suddenly noticed that he was as drawn to her as she was to him. For a brief moment my little brown dog and this ailing man I barely knew seemed to revel in each other’s presence. He touched her head and it was different from the dozens of other people who had patted her soft brown curls that afternoon. Dr. Kent’s hands were practiced—both firm and gentle. All afternoon people had been asking me what kind of dog Cocoa was and how old she was. Dr. Kent had never met her but he knew. He knew what kind of dog she was. With fingers that seemed to work instinctively, he felt her head and her teeth then he told me how old she was. Did I mention that Dr. Kent was a retired veterinarian? Seemingly as a matter of habit, Dr. Kent had examined Cocoa. It was a beautiful, loving touch of a master’s hands. Just as beautiful was Cocoa’s adoring response to the touch of this master’s hands. Oh, to be like Cocoa—to be drawn toward The Master—uninhibited and unhindered; to feel The Master working in my life and to adore being held by The One who knows me better than anyone else. 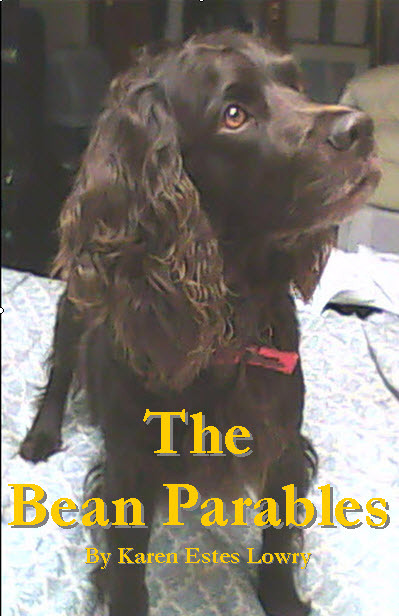 This story is an installment of “The Bean Parables.” These are life lessons I’ve learned from life with two adorable Boykin Spaniels named Bean and Cocoa. This entry was posted in Uncategorized and tagged Bean Parables, Boykin Spaniel, Hoss Kent, Karen Estes Lowry, Kent, Mountain Brook Baptist Church. Bookmark the permalink. Thank you. I hope to add more lessons I’ve learned from my dogs.